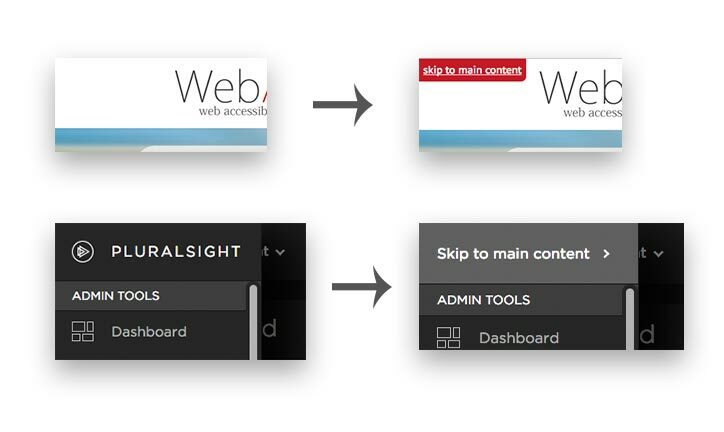 Give keyboard users a way to get to the main content of your site quickly. Users of your site might use a keyboard for a number of reasons. They might suffer from a visual impairment and be using a screen reader which is controlled by the keyboard. They might prefer the keyboard for quick mobility. In either case, handling keyboard navigation on your site allows these kinds of users to access your content more quickly and happily. When a website is loaded and you tab into the page the first time, the focus will go to the first focusable element. This first focusable element is almost never the main content. If you consider the informational architecture of the page, often there is some sort of hierarchy that defines where within the larger site this particular page resides. This means site or page navigation will often occur in the hierarchy previous to the main content. And navigational elements links anchor tags and buttons are all focusable. These navigational elements are useful but are hardly the main event on the page. When you visit a page, do you pore over the page nav or layout? It’s more likely you try to gather the quick information you sought or you want to dive right in and experience the best material offered. In short, you want to skip to the main content. The accessibility feature of “Skip to Main Content” allows you to get past all the navigation and end up at the main event. This is an element that usually appears high in the page hierarchy, often the first focusable element on the page. When selected, it will move focus for the keyboard user or screen reader to the main content on the page, allowing reading or navigation to continue from there. Do you enjoy having a “Skip to Main Content” feature on sites you visit? What are some other ways you’ve implemented it?